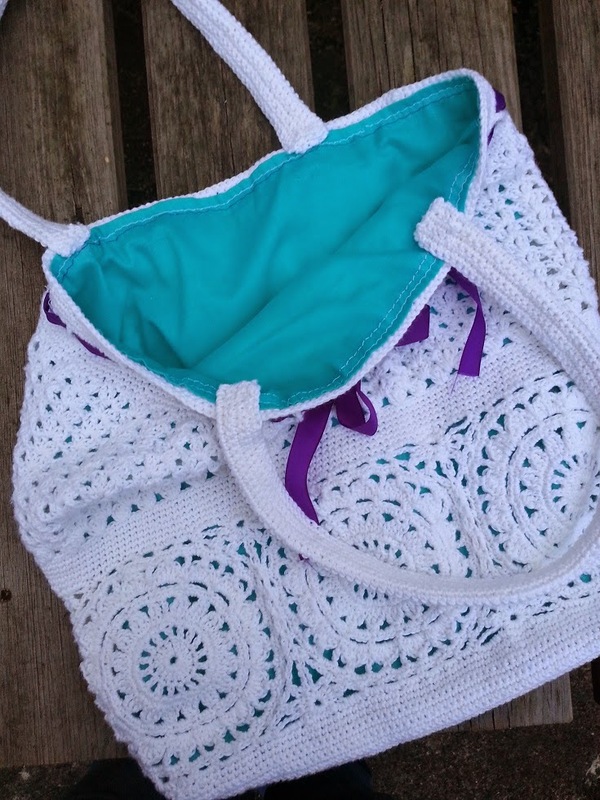 Hooking Crazy: Lacy Doily bag Ta-dah! Phew! 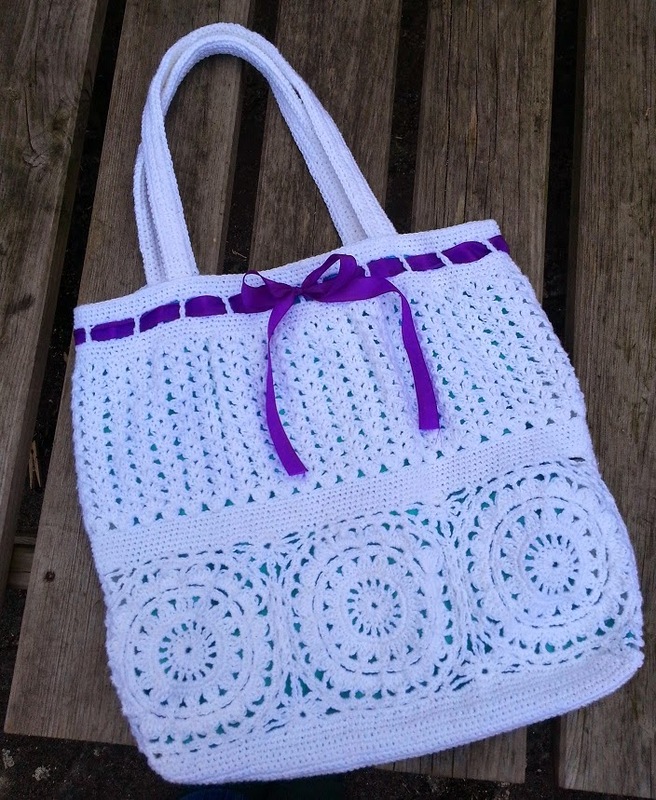 I have finally finished my Lacy Doily Bag. I am not going to lie, the last bit of this bag was NOT fun, in fact there were many times when I almost jacked it in to finish another day but knowing how terrible I am at finishing things like this once I've stopped, I persevered and got the last of it done today. The reason I struggle to finish things like this is because I wasn't working from a pattern so was following a make-it-up-as-you-go-along method. I had seen a picture of a similar bag and loosely followed that. It was fine for the main bits, the doily cricles that make up the bottom and the chevrons of trebles for the top half but all the other bits (like how to do the bottom, how to finish the top, how to do the handles) all required much thought and a certain amount of trial and error. 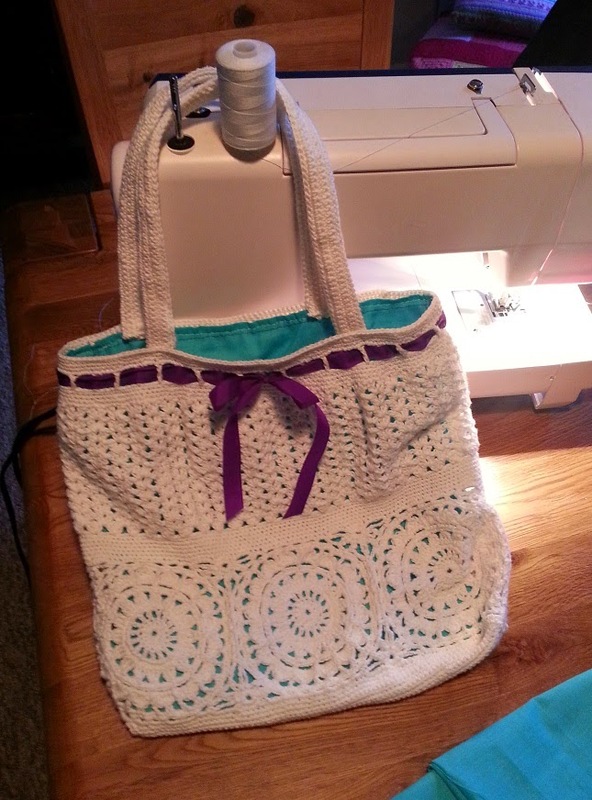 The handles and the top edge of the bag took a lot of patience, lots of rows of tiny double crochet stitches to make those bits nice and sturdy. I also wanted to add a splash of colour to it so I made a gappy bit around the top to feed some ribbon through. 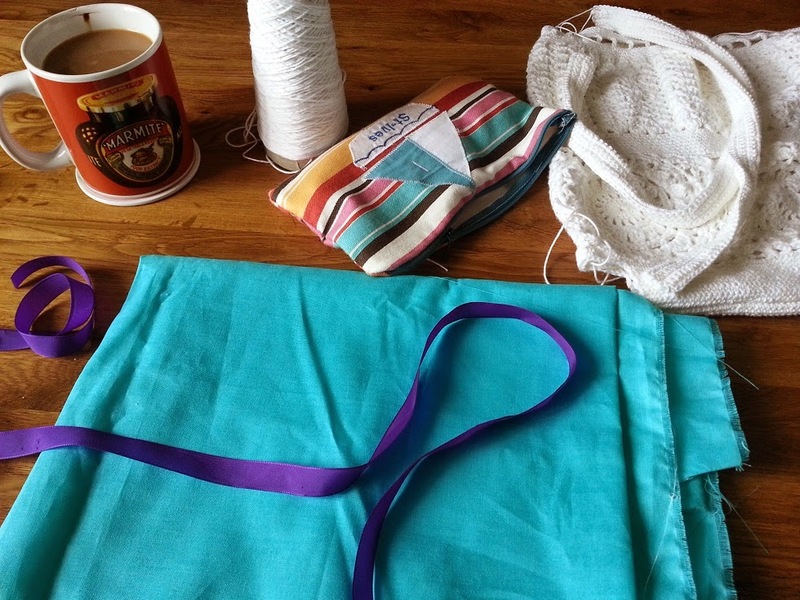 I picked those bits up this morning and set to running up a lining and attaching it to the bag. 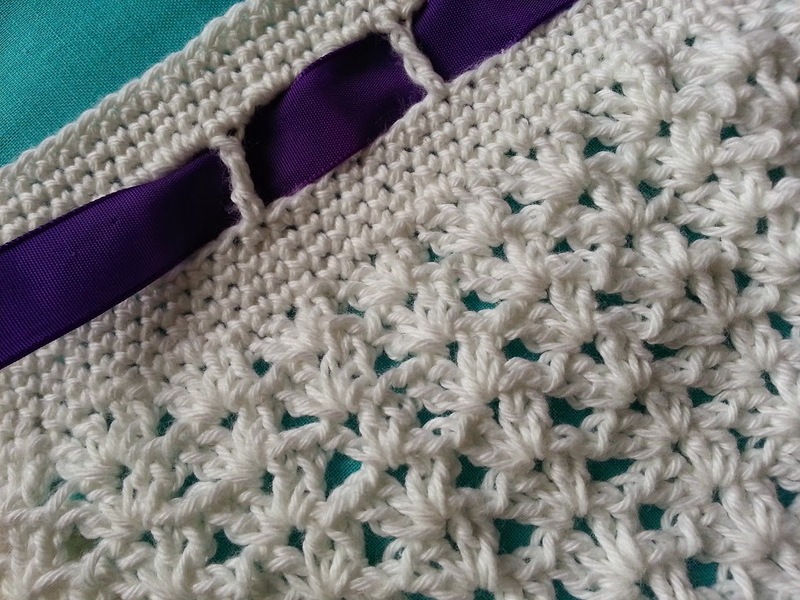 Luckily as this crochet is quite a thin fabric I could run it under the machine to attach the lining, perhaps not the neatest sewing but much neater than it would have been had I attempted to do it by hand! So here it is, Ta-dah! The usual issues of light for photos at this time of year but you get the idea. I wanted to keep it quite vintagey, in keeping with the lace so chose the ribbon and teal lining rather than going for anything too busy or neon. I am so happy to have finished it, I have been beaming from ear to ear since I got that last handle sewn on. This was my project to do while I was having a crochet crisis and being all frustrated at not knowing what to make. It has taken a couple of weeks, which is fine, I was in no real rush and it has been good fun to make for the most part. Even the last few endless rows of DC have given a certain amount of satisfaction now I can see it all together. I won't be hurrying to make another one, I am craving colour! 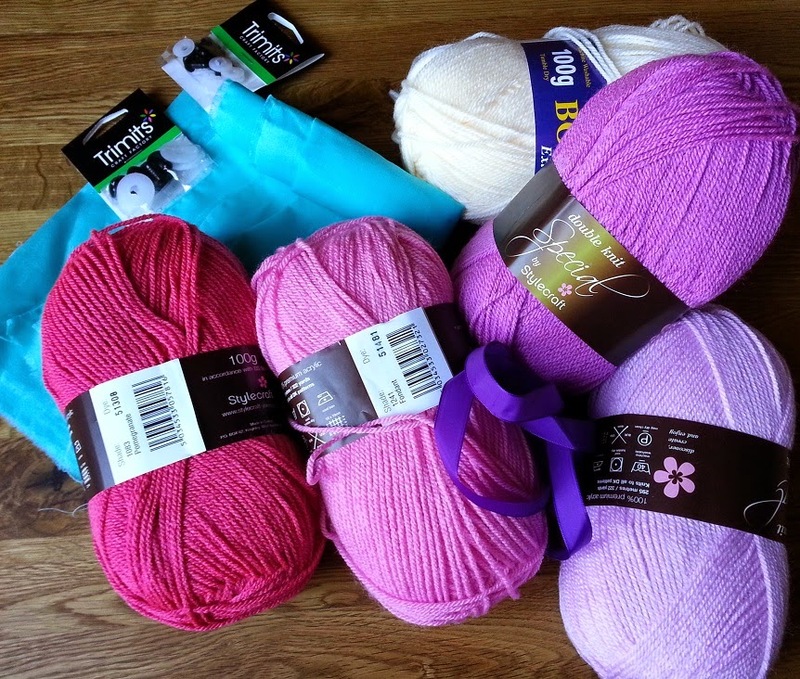 I got some pretty pinks this morning while buying the fabric for the bag lining so I am going to get cracking on something else now, something pink and bright!